Our Deputy Head teacher, Mrs Kate Gowing, is our Special Education Needs Co-ordinator (SENCo), and is based in the Rainbow Room. She can be contacted through the main school office. At Westmeads we believe that all children are special - they develop skills at different speeds, for a variety of reasons, and like us, have strengths and weaknesses. Some children may need the opportunity to extend skills while others may need support in certain areas. We believe it is very important that all children are given the opportunity to achieve their potential and that any problems are identified quickly so that appropriate help can be given. Early identification of any difficulty is important and we encourage Parents/Carers to contact us before their child is due to start school and tell us if they feel their child may need extra help, or if they have a social, emotional or medical problem. This will be kept confidential to those who teach and help the child. Every effort will be taken to provide additional help and support where necessary, so that the child’s time at school is happy and enjoyable from the start. At regular times in the school year the class teachers meet with the SENCo to monitor progress & to plan additional individual or small group support. This support may be called ‘SEN Support’ and includes where assessments are made by school staff and also where a higher level of support, usually with advice from other agencies such as Speech Therapy, is required. Sometimes, a child might undergo ‘Statutory Assessment’ while at the school and might have an ‘Education and Health Care plan’, requiring a higher level of multi-agency support. A child who is having difficulties can get help in different ways. 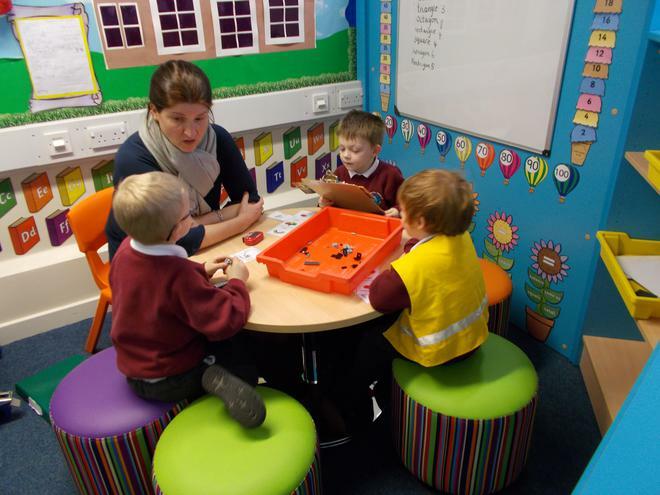 The class teacher can make everyday tasks a little easier or put the child in a small group for some extra help with a teaching assistant, under the guidance of the class teacher. Teaching Assistants (TAs) can also be allocated to do specific work with them in order to help them catch up where they may have got a little behind on something, or to work with them to pre-teach skills, so that they are prepared when the rest of the class learns something new. Indeed many children receive additional support with their learning from adults in 1:1 or small groups, who do not have special educational needs but are merely in need of support in a particular area of the curriculum. In line with the current ‘Code of Practice for SEN’ we believe in involving all children actively in their own learning. Our policy is to work in partnership with families, involving them with planning, giving suggestions of how they can support their child at home, and also a review of targets set. This ensures they feel able to take an active part in helping their children at home. We also listen to Families’ knowledge of their child, so that school and home can work together to better understand and support learning. By continually tracking progress we are able to adjust support to meet the child’s needs at that time. When appropriate, we involve outside agencies for their expertise. These include Speech Therapists, an Educational Psychologist and Specialist Teaching and Learning Service etc. Families are always included in any decision to request this type of extra support for their child. Class teachers also identify children who are working at a greater depth in any area of the curriculum. These children are supported and challenged in their area of strength and are given opportunities to practice and share their talents. Through lunchtime and after school clubs, children are encouraged to try different activities and develop their skills and interests. We advocate inclusion and celebrate diversity at all levels. We encourage all adults and children to support and respect each other. Within this positive atmosphere we aim to provide equality of opportunity for all children and this is written into all our school policies. There is a full copy of the SEN Policy available below and in the school office. Its effectiveness is reviewed annually, the purpose of which is to ensure that all our children are given the opportunity to make the most of their abilities before they move to Junior School.